Home https://server7.kproxy.com/servlet/redirect.srv/sruj/smyrwpoii/p2/ World https://server7.kproxy.com/servlet/redirect.srv/sruj/smyrwpoii/p2/ ISIS Cases Raise a Question: What Does It Mean to Be Stateless? Shamima Begum was 15 when she became radicalized, left home in London for Syria and joined the Islamic State, marrying one of its fighters. 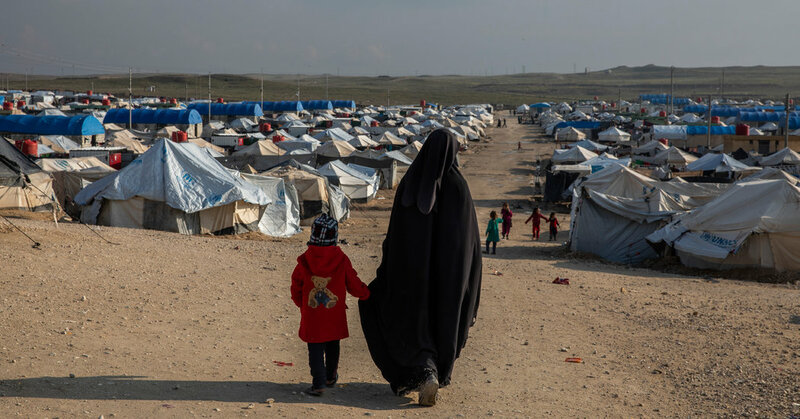 As the group's grip on its last pieces of territory slipped, Ms. Begum, 19 and pregnant, fled to camp in northern Syria. When she met a British reporter there, she made one thing clear: She wanted to come home. But Britain's Home Office informed her family by letter of its plans to strip her of her citizenship. The government says it is acting to protect the British public first. But a lawyer for Ms. Begum, who recently gave birth to a baby boy, said the move would render the British-born woman stateless. The dilemma of what to do with citizens of Western countries who threw in their lot with the Islamic State before it was largely ousted from Syria has set off a debate on citizenship and the statelessness that might result from stripping some of their nationality. "This is leaving people homeless without protection and any form of international cooperation," said Clive Baldwin, a senior legal adviser for Human Rights Watch. What is statelessness and how widespread is it? The United Nations refugee agency defines a stateless person as someone who does not have the nationality of any country, they fall through the cracks. Others become stateless as new nations emerge, or borders change. It can mean a life in perpetual limbo, said David Baluarte, an expert on statelessness and professor of law at Washington and Lee University. At least 10 million people globally are stateless and most – more than 75 percent – are part of minority groups in the countries where they reside. The Rohingya of Myanmar, the Nubians of Kenya, Dominicans of Haitian descent and the Bidoon of Saudi Arabia are just some of the denied nationality communities. "Its unfortunately not uncommon for governments to identify an ethnically or racially or religiously disfavored group and then to sort of systematically write laws that strip the fundamental rights of those people, "Mr. Baluarte said. Since the end of World War II – part of a response to Nazi Germany stripping Jews of their citizenship before rounding them to and ghettos and then concentration camps – international law has codified protections for the stateless. "That legal protection exists, so states that are stripping people of nationality and leaving them stateless are violating that law," Mr. Baluarte said. The United States has its own precedent. In 1958, the Supreme Court ruled in Trop v. Dulles that it was unconstitutional to revoke citizenship and make someone stateless as a punishment for a crime. Unicef ​​has also urged countries to consider the best interest of children when weighing stripping citizenship from Islamic State recruits who are parents. . "Every child has the right to a name, an identity and a nationality," the organization said in a statement. Sajid Javid, Britain's home secretary, has taken a hard line on the citizenship issue, but speaking in front of Parliament , he seemed to suggest that Ms. Begum's newborn son would retain his citizenship. "Children should not suffer," he said. "So if a parent does lose their British citizenship, it does not affect the rights of their child." The risk of returning Islamic State members. Mr. Javid, speaking to Parliament on Wednesday, left to those who had joined the Islamic State from returning to Britain. He said the home office could be non-British citizens from entry to the country, or strip "dangerous individuals" of their British citizenship. "I have been resolved that where they pose any threat to this country, I want you everything in my power to prevent their return, ”Mr. Javid said. "They turned their back on this country to support a group that was butchered and beheaded innocent civilians, including British citizens." The Home Office said in a statement that Mr. Javid has the power to deprive someone of their British citizenship where it would not render them stateless. The office did not comment on Ms. Begum's case, but British authorities are reported to be against it because her mother has a passport from Bangladesh. However, according to Tasnime Akunjee, a lawyer for Ms. Begum's family, the young woman is not a citizen of Bangladesh, and that country has said she will not be allowed entry. That would render her stateless. Mr. Clive of Human Rights Watch said, "Take away citizenship" on the whims of a minister "is setting a bad precedent. Beyond that, it can make it hard to keep people legally accountable for their actions. In the case of Ms. Muthana, the Islamic State volunteer from Alabama, Mr. Pompeo's statement that she is not an American citizen contradicts information given by her family and lawyer. Hassan Shibly, a lawyer with the Council on American-Islamic Relations who is advising the family, said Ms. Muthana was not a Yemeni citizen. He provided a birth certificate for her that showed she was born in Hackensack, N.J., in 1994.